This is one of easy snack can be served as main dish too, I do this way which is fool proof method. Hope this works for you too. 1. Mix the besan, sugar, rawa, citric acid/lemon juice, water,oil, salt ,ginger and chilli paste without any lumps. Use whisk to make this job easier. 2. Now keep this mixture aside and make the steamer ready. 3. Coat a deep plate with the oil. 4. Now add the eno and mix well. The batter will be very foamy. 5. Immediately pour the batter in the plate and steam for 20 to 25 minutes. 6. When it is cooling sprinkle the chilli powder. When it cooled completely cut into squares and let it be in the same plate or vessel. 7. Prepare the solution and tempering. 8. Mix 2 tbsp of water to 1/2 tbsp of lime juice and 1/2 tbsp of sugar and keep it aside. 9. Heat oil in a small pan add mustard seeds, sesame seeds when it splutters add asafoetida and sliced green chillies. 10. Add the prepared lime solution to the tempered oil. 11. 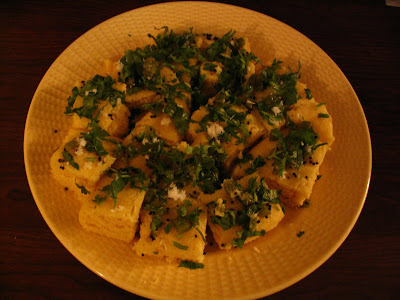 Now pour it over the Dhokla that is sprinkled with chilli powder and spread with the spoon. 12. Garnish with Coconut, coriander leaves. 1. Once the dhokla is steamed..let it completely cool to get very neat squares. 2. Dhokla flour is available in the market with little grainy texture. If you are using it you can completely avoid adding rawa in the recipe. Rawa is added just for the texture. It is absolutely optional. this is my favourite recipe and in pictures it looks yumm...ll try and let you know.cheers! Dhokla...my favourite. urs look perfect.